Lock in a great price for Ducato Suites,adults only – rated 9 by recent guests! We loved the fact that it was in the center of shopping and restaurants. The staff was amazing!!!! The staff was incredible!!!! Mary at the front desk was a sweet heart and so were all the other staff. They made you feel so welcomed and special. The breakfast is absolutely incredible. You pick everything you want and they bring it all to your room in the morning at the time you have requested. The location is also the best possible you could have - quiet down some steps but close to the main part of town. Additionally, the rooms are absolutely beautiful. 9 of the 11 rooms come with a private pool and ours was an indoor pool - this was incredible and great to have during the heat of santorini summer! The amenities. The friendly staff, Maria and the rest are all very accommodating. They made us feel very comfortable. I cant say enough good words on how hospitable the staff were. The suite that we booked is PERFECT. All of my friends and colleagues loved the place as theyvr seen on my photos and videos amlnd I have started recommending this villa. They are on the perfect location, if you want the sea and volcano view. Plus a little bit of overlooking the Santorini famous blue domes that can be seen from your own pool. The whole suite is clean. If we go back to Santorini we will definitely book here again. Thank you for the wonderful experience and stay! The staff is super friendly and helpful!! The breakfast is really good!! The view is amazing!! They will book everything for you, the breakfast served every morning at the exact same time - lots of options! Very friendly staff. Mary,Dimitra and George were the best! We haven't experienced such warm hospitality from hotel staff in a long time (and we travel frequently). The hotel was great, but it was these there exceptional individuals that made the difference. The views were amazing! The staff and room were beyond what we expected! Own private pool and patio. Breakfast was phenomenal and was delivered to our room. Highly recommend. Ducato Suites,adults only This rating is a reflection of how the property compares to the industry standard when it comes to price, facilities and services available. It's based on a self-evaluation by the property. Use this rating to help choose your stay! 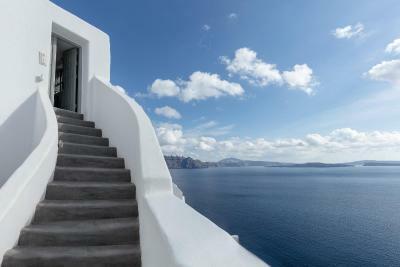 Located on the cliffs of Oia, Ducato Di Oia features magnificent Aegean Sea and volcano views. Μost rooms feature a private indoor or outdoor heated plunge pool. Luxuriously decorated with antiques and masterpieces, each room at Ducato Di Oia opens to balcony with majestic views of the world-renowned Santorini sunset. Each is fitted with a satellite, flat-screen TV. The elegant bathroom is stocked with a shower, while free toiletries are also offered. Free WiFi is provided in all areas. There is a 24-hour front desk at the property. Other services include bell boy service, limousine airport transportation, organized excursions and tours and wedding arrangements. .
Fira, the cosmopolitan center of Santorini, is 6.8 mi away. The port is 6.2 mi away, while Santorini Airport is at 9.9 mi. When would you like to stay at Ducato Suites,adults only? 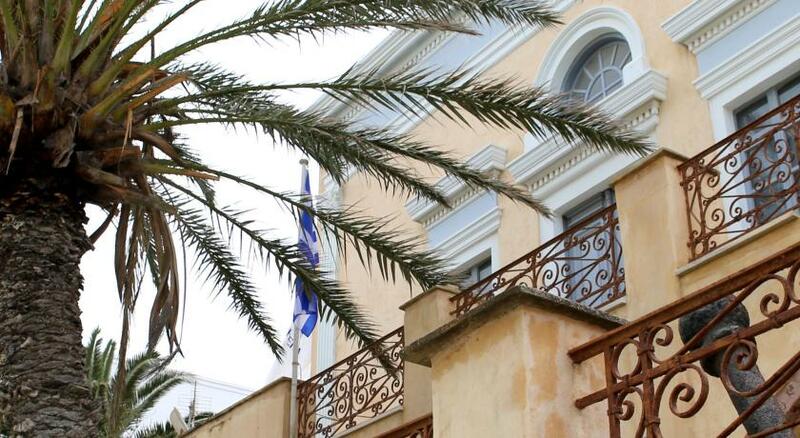 A complimentary bottle of Santorinian wine and a basket of fruits are offered upon arrival. -a bathroom with rain shower and bathroom amenities. This suite features a hot tub, mini-bar and bathrobe. This suite features a private pool, bathrobe and mini-bar. This suite has a sea view, bathrobe and soundproofing. House Rules Ducato Suites,adults only takes special requests – add in the next step! Ducato Suites,adults only accepts these cards and reserves the right to temporarily hold an amount prior to arrival. Please note that the property provides transfer from/to the port/airport upon charge. Guests are kindly requested to inform the property at least 3 days in advance if they wish to make use of this service. Contact details can be found on the booking confirmation. I planed my proposal in Ducato Di Oia hotel , and the hotel manager prepared a beautiful flower bouquet for me , and upgraded us to a larger room type with a beautiful pool and prefect view , and the staff were very friendly and helpful , they arrange everything perfectly ! Nothing in our room. While all of the other rooms have private pools their patio area may not be as private since some people may need to walk by to get to their room. When we showed up we were upgraded to the Folegandros Superior Suite with Infinity Pool & Caldera View. We were skeptical since we had picked out our room specifically; however, they let us see the other room and the staff was spot on the Folegandros was amazing! (not that the other room wouldn't have been). The staff was extremely helpful from recommending restaurants (and handling the reservations) so suggesting tours and setting up transportation. They even helped us get from one hotel to the next (Oia to Fira) as part of an adventure that day. The breakfast was excellent on our patio with a great view. FYI we went in October and the weather was fine the pool was heated to be comfortable (cooling) during the day and still mostly comfortable at night. The bathroom and room was amazing and a great looking cave accomodation. Excellent place with a very kindness staff. Thank you Mary and Julio. Everything was perfect : the room, the view, the situation close to the Main Street and churchs. Take a breakfast in the terrasse and swim in the afternoon with a caldera view it was amazing. The pathway is very quiet. Dionysis help us to bring our luggage. Thank you all of us to make my vacation so happyness. The staff was excellent!!!! Very friendly & helpful! The breakfasts were delicious, delivered right to your door!, Excellent location, would definitely stay there again! Amazing scenery, great rooms (and pools), stunning staff! Perfect location, very clean and extremely friendly staff.